Memorial Medical Center in Las Cruces, NM is a LifePoint Acute Care Hospital nestled in the beautiful Land of Enchantment. Las Cruces offers a multitude of outdoor adventures, unique culinary experiences, vibrant heritage and culture, top-rated farmers markets and beautiful views of the Organ Mountains. to focus on the exceptional care we provide our families, friends, and neighbors. At Memorial Medical Center we strive to create places where people choose to come for healthcare, physicians want to practice and employees want to work. Our focus in these areas is evident daily as we deliver high quality patient care, support our physicians, create excellent workplaces for our employees and take leadership roles our community all while maintaining scal responsibility. Memorial Medical Center is proud of our achievements and recognition. We are accredited through The Joint Commission for our Total Hip and Knee Joint Replacement Program, Commission on Cancer Accredited Program, and a Chest Pain Center accreditation through SCPC. We have been awarded the 2018 Readers Choice Favorite Hospital. 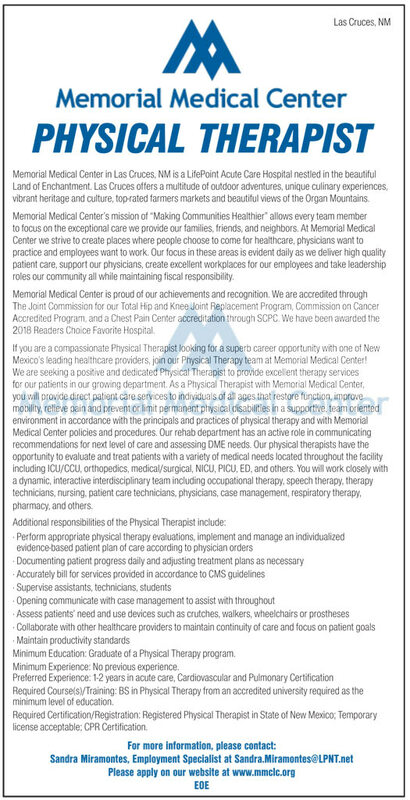 If you are a compassionate Physical Therapist looking for a superb career opportunity with one of New Mexico’s leading healthcare providers, join our Physical Therapy team at Memorial Medical Center! you will provide direct patient care services to individuals of all ages that restore function, improve mobility, relieve pain and prevent or limit permanent physical disabilities in a supportive, team oriented environment in accordance with the principals and practices of physical therapy and with Memorial Medical Center policies and procedures. Our rehab department has an active role in communicating recommendations for next level of care and assessing DME needs. Our physical therapists have the opportunity to evaluate and treat patients with a variety of medical needs located throughout the facility including ICU/CCU, orthopedics, medical/surgical, NICU, PICU, ED, and others. You will work closely with a dynamic, interactive interdisciplinary team including occupational therapy, speech therapy, therapy technicians, nursing, patient care technicians, physicians, case management, respiratory therapy, pharmacy, and others. Minimum Education: Graduate of a Physical Therapy program. Minimum Experience: No previous experience. Required Course(s)/Training: BS in Physical Therapy from an accredited university required as the minimum level of education. Required Certi cation/Registration: Registered Physical Therapist in State of New Mexico; Temporary license acceptable; CPR Certi cation.